Spaghetti and meatballs, cannelloni, brick-oven pizza, and antipasti. When it comes to nostalgia-inducing, mouthwatering dishes, Italian cuisine is certainly one of the first to come to mind with its long-standing history of flavors and simple ingredients. 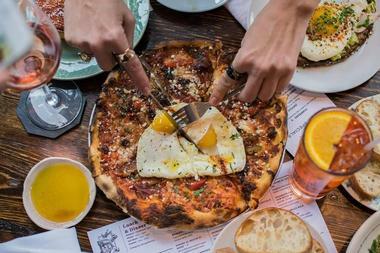 After all, you'll be hard pressed to find someone who doesn't like pizza, and when it comes to Bostonians, you'd better be sure you know what you're doing if you plan to open up an Italian restaurant. From authentic trattorias to upscale establishments, here are the best Italian restaurants in Boston. 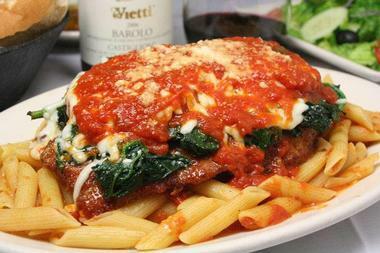 Having been called "a worthwhile destination" by the Boston Herald, "gourmet greatness" by the Phantom Gourmet, and "North End home cooking" by the Boston Globe, visitors to Al Dente can rest assured that they're in good culinary hands. 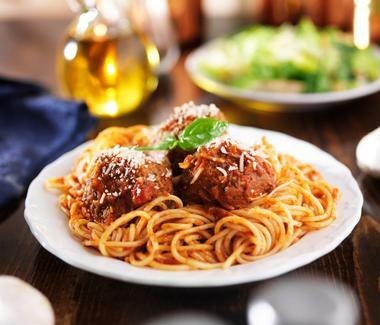 Al Dente promises authentic Italian cuisine from all the regions of Italy and delivers on this promise with an outstanding menu of pasta, seafood, veal, and chicken among other luxurious Italian specialties. What many love about Al Dente is the open kitchen that allows visitors to see all the action unfold when it comes to the superb meal they're about to tuck into. The restaurant itself is cozy and casual, allowing for a completely relaxing meal in the heart of Boston's world-famous North End. There's no denying that Antico Forno is home to a well-prepared variety of rustic dishes. From brick-oven pizzas to terra cotta pot plated entrees to good old bread and olives, Antico Forno takes pride in their delicious offerings and proudly sits on the list of top ten Italian restaurants around the world. The restaurant features a mom-and-pop atmosphere while also being lively and loud. There are no gimmicks when it comes to Antico Forno. At the heart of this restaurant are the beloved traditional Neapolitan pizzas, baked in a wood-fired brick oven, that make Antico Forno a North End mainstay. Entrees to try include the saltimbocca di pollo and the linguine al frutti di mare, which have helped earn Antico Forno the billing of "The Most Authentic Italian Restaurant" in Boston. 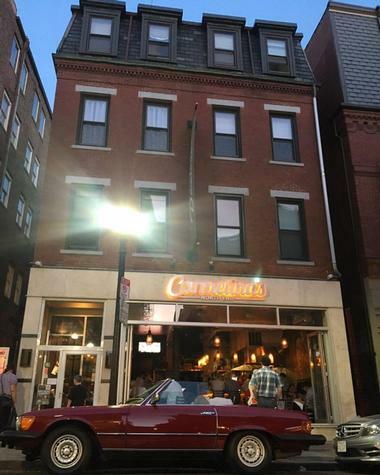 Opened in 2012, Carmelina's serves up traditional Sicilian comfort food with their own unique Mediterranean twist from the heart of Boston's famous Little Italy. The restaurant is run by Executive Chef Damien DiPaola, who transforms his family's old but delicious recipes into modern Italian gastronomic delights with the help of Chef di Cucina Michael Hollenkamp. The open kitchen in Carmelina's is reminiscent of a mother's cooking space, while the dining area is incredibly homey with family photos hanging from the walls. 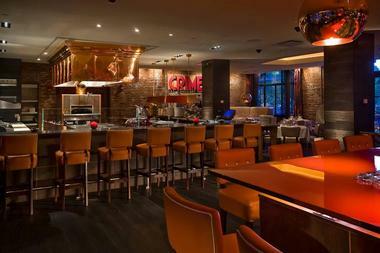 Carmelina's offers you a relaxing and intimate dining experience while you enjoy a feast of inspired and fresh food. Pasta lovers can tuck into the frutti di mare, calamari and mussels, or the tonno con pesto Siciliano e fusilli, while show-stopping entrées include the pesce pistachio and stuffed center cut pork rib chop. You know a restaurant's good when it's got a line that stretches down the block and around the corner. 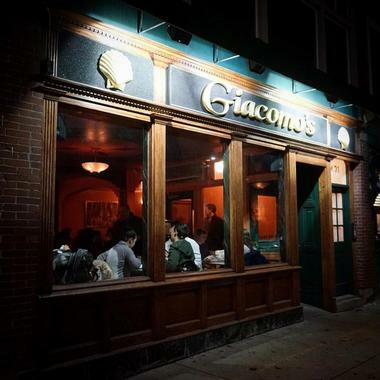 That's exactly what visitors can expect when dining at Giacomo's in Boston's North End, also known as Little Italy. Giacomo's is a no-reservations, cash-only kind of eatery with chalkboard menus hanging around the establishment displaying all kinds of meat, sauces, and homemade pastas on offer. 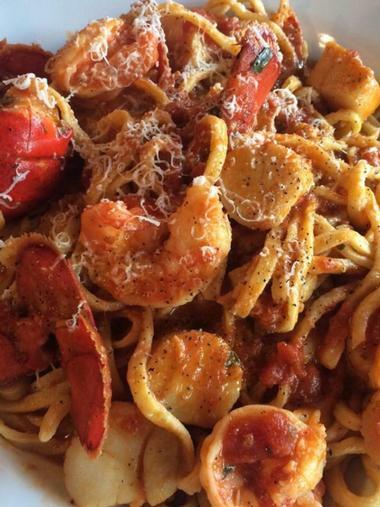 The fra diavolo sauce is particularly popular with Giacomo's regulars, while house specials like the zuppa di pesce will have your taste bud's singing. They also have an extensive appetizer menu as well as chicken or veal marsalas and parmigianas. Though the food is absolutely spectacular, don't expect to sit around and linger once you've finished eating: Doing so may result in a long look or two from the wait staff and the many people eager to get in. 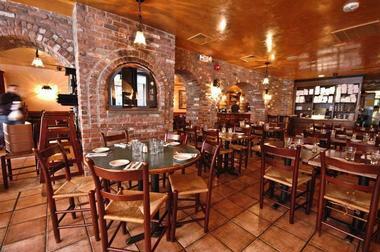 There are two reasons that Mamma Maria is a top pick for large parties in the North End. First, they've got a reputation for great service, and second, they have a penchant for stand-out food. 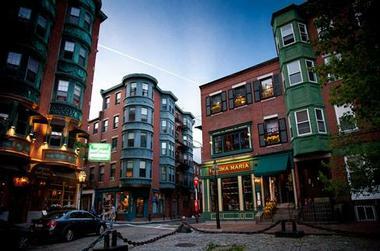 Founded in 1973, Mamma Maria sits on a small hill overlooking the city in America's oldest public square - North Square. The restaurant has five private dining rooms perfect for private events, a quiet space that is both upscale and down to earth, and a menu to die for. Whether you're at Mamma Maria for a private event or a dinner date, the suckling pig risotto is a must-try. Dishes like the veal porterhouse, short rib, rabbit pasta, and osso buco are also fantastic options for lunch or dinner. With a traditional yet novel menu, Nebo Cucine and Enoteca is the brainchild of the Pallota sisters, who were inspired by the family recipes of their mother and grandmother. Carla, who also happens to be the restaurant's chef, and Christine actually grew up in Boston's North End, making the neighborhood the perfect choice for their restaurant. 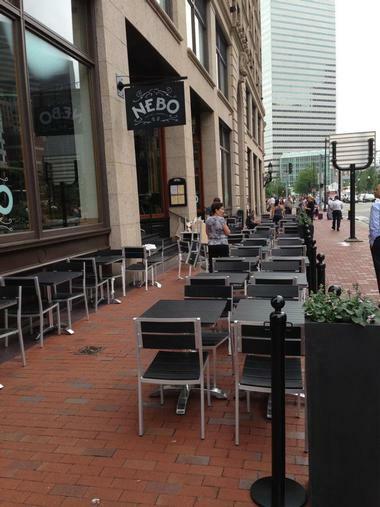 Capturing the true essence of dining in an Italian home, Nebo has a strong menu of traditional favorites. For example, the light and unbelievably creamy burrata makes a perfect starter alongside the smoky cozze (skillet-roasted mussels). 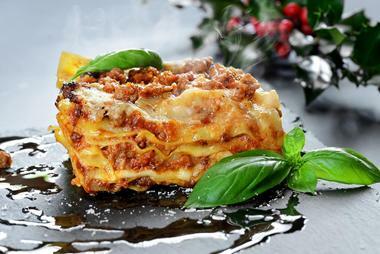 Meanwhile, the golden Milanese or the popular zucchini lasagna are great options for a main course. 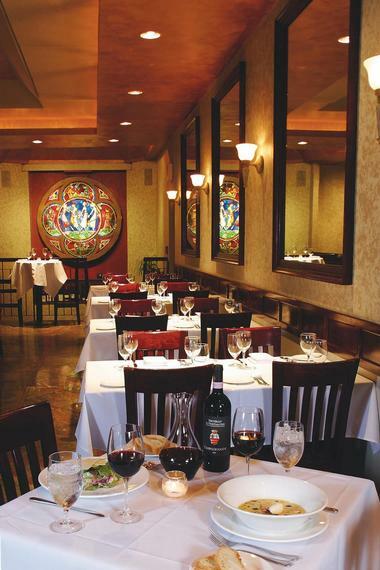 If you're looking for a fantastic traditional Italian dinner in the relaxing atmosphere of Boston's historic North End area, then a trip to Panza is exactly what you need. The perfect spot for a dinner out with the guys, a girl's night, or a date, Panza is eager to please with their extensive menu and quality ingredients. Choose between season specials or pick from house favorites for an enjoyable meal. 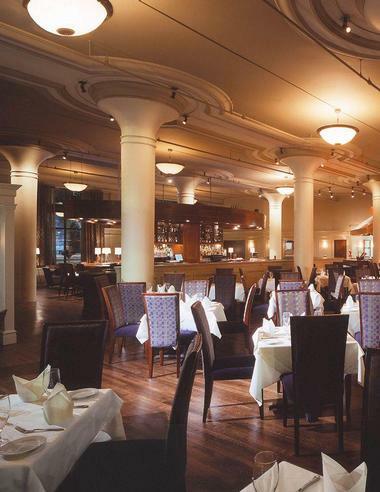 Bestsellers at Panza include signature dishes like the seafood risotto, Veal Panza, and chicken parmigiana. The pasta menu has 14 varieties on offer, with the potato gnocchi Bolognese, beef and veal tortelloni, and tarragon fettuccine and grilled lobster tails guaranteed to be crowd pleasers. Don't forget to take a look at the extensive wine list to enjoy the perfect accompaniment to your meal. 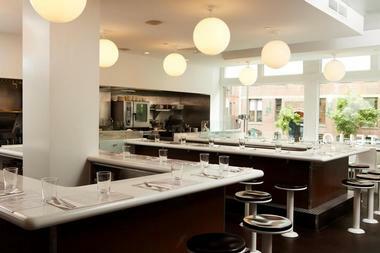 Impressive and nostalgic, Prezza brings a contemporary spin to North End classics, making it a mainstay in Boston's culinary scene. 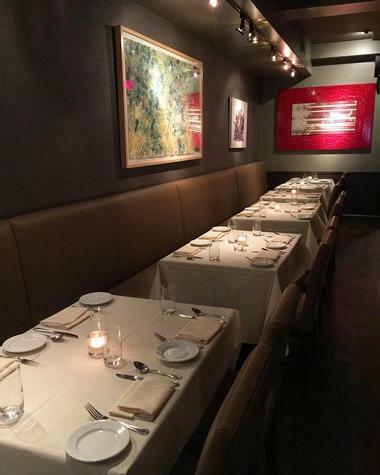 Led by Chef Anthony Caturano, Prezza is all about tradition. 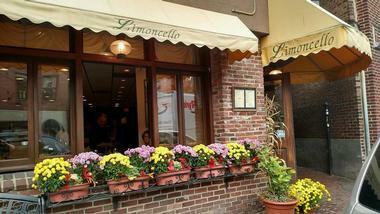 In fact, the restaurant is named after an ancient Italian town from which Chef Anthony's grandmother hails. Additionally, Prezza's cuisine is based on this town's food, taking peasant-style Italian cooking and updating it by adding Mediterranean flavors to the mix. While the menu is in constant flux to make way for impressive seasonal dishes, there are definitely a handful that are distinctly Prezza. For example, adventurous eaters should definitely try the octopus carpaccio. Meanwhile, those who want something a little more traditional will certainly enjoy every bite of Prezza's black truffle gnocchi. A contemporary grill, pizzeria and rosticceria in the heart of Boston's Little Italy, Quattro features a casual dining atmosphere with great food made with ingredients sourced locally in surrounding neighborhoods. One of Quattro's major draws is its rotisserie, which regularly roasts spectacular legs of lamb, ribs of beef, whole chickens, and pork loins. Additionally, Quattro features artisan pasta that is made by hand just a block away in DePasquale's Homemade Pasta Shop. Meanwhile, pizza lovers will go gaga over Quattro's creative pizzas, which are baked at 900 degrees in a wood-burning Marra Forni brick oven flown in from Naples. Dinners are made complete with various small plates on offer. 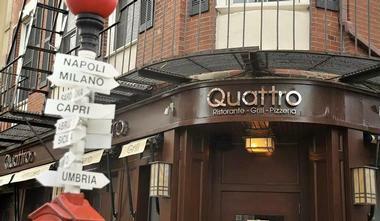 Heading to Quattro for lunch? Try one of their roast meat paninis for something quick and satisfying in the middle of your work day. 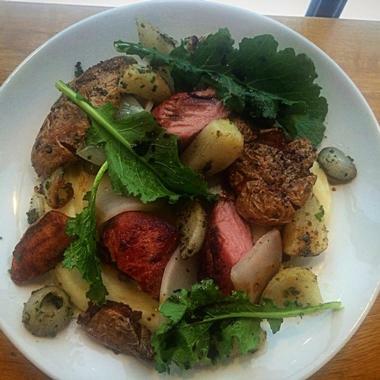 Rino's Place gives new meaning to a "neighborhood joint." Located in a residential area of East Boston, Rino's Place has been dutifully pleasing diners from inside and outside its neighborhood with classic Italian cuisine for over 24 years. The restaurant was opened by Rino and Anna DiCenso, but is now run by their son Chef Anthony DiCenso, who was born and raised in Italy. Today, under the watchful eye of Chef Anthony, Rino's is well known in East Boston for their incredible red sauce, giant ravioli, and thin-cut veal. Beyond the magnificent food, the wait staff at Rino's truly knows how to deliver world-class and personalized service and will go the extra mile to learn the names of guests, what they like to drink, and even what they ate on their previous visit. Sorellina is all about sophistication. From a chic black and white dining room to Italian cuisine that can only be described as classically posh, Sorellina pays great attention to detail and goes above and beyond when it comes to pleasing their guests. Sorellina is run by chef and owner Jamie Mammano and presents a contemporary take on traditional Italian-Mediterranean fare. Fine detail is paid to every facet of a dish, just like the squid ink couscous and tender-grilled octopus. The maccheroncelli is a fine choice as well, as the meatballs are made from American wagyu beef and given a generous glaze of Montepulciano sauce before being topped with sharp Parmigiano. A sure favorite at Sorellina, however, is the traditional Milanese, which features a bone-in veal chop served with oven-cured tomatoes. Absolutely delicious! Casual, lively and very much Italian, Sportello offers a menu of trattoria-inspired Italian cuisine for lunch and dinner from within a modern interpretation of the American diner. 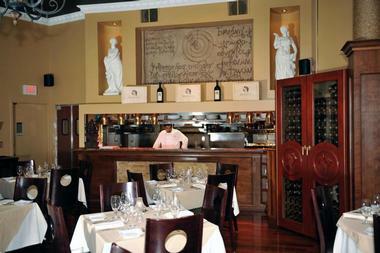 Run by Chef Barbara Lynch, Sportello has all the great bits of Italian cooking without the fuss. From fresh pastas to simple yet delicious soups and creamy polenta, it's no wonder this eatery is as popular as it is today. Diners are welcome to sit at one of several large communal counters, all of which offer a great view of the hustle and bustle in the open kitchen. Are all the tables full? No problem. Grab something to go or pick a quick bite from the bakery counter then take your meal with you for a waterside picnic by the channel at Fort Point. 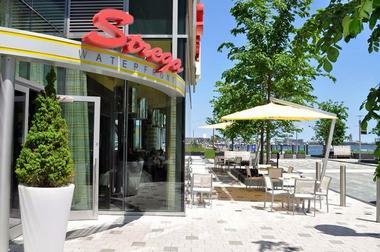 Located in the much-adored North End, Strega is a swanky restaurant that enjoys putting playful twists on Italian favorites through the use of novel ingredients and unexpected sauces. 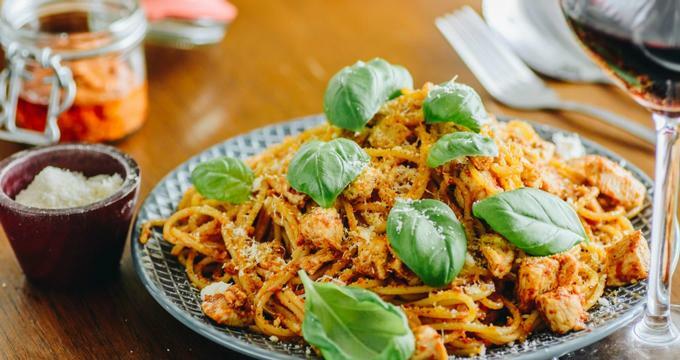 While there's no doubt that the restaurant loves to serve their own take on traditional Italian fare, they also know the importance of sticking to their roots as they still serve enough of Italy's classics to rival the other eateries in the neighborhood. 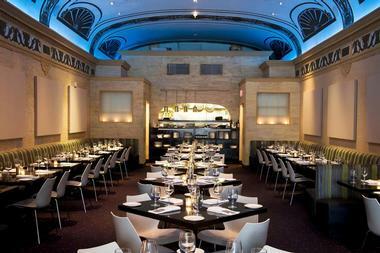 Some menu items to look out for include the pan-seared Chilean sea bass, which is served over delicious yucca gnocchi. The deep-sea scallops are also enough to make even the pickiest eater's taste buds sing as they are sautéed with Grand Marnier. Though the restaurant's specials may be on the pricier end of the spectrum, they're absolutely worth every penny. Teatro can easily be described as the very definition of casual elegance with each visit providing a vibrant dining experience at the heart of Boston's busy Theater District. The restaurant is run by Chef Jamie Mammano, the man behind other famous Italian establishments like Ostra and Sorellina, and offers an inviting dining area and bar scene at the heart of the Massachusetts capital. Visitors are welcome to visit Teatro for a post-work craft cocktail or to stay for the evening to experience Chef Mammano's distinctive and modern approach to long-standing Italian favorites. Some of the must-try entrees include the gnocchi served with ricotta, marsala sauce, parmesan cream, mixed mushrooms, and Reggiano, or the scungilli, which features a succulent Maine lobster and Vermont butter. It's undeniable that Boston is home to some of the best Italian restaurants in the world outside of Italy, and when it comes to a fine Italian steak, nobody in Boston does it better than Davio's Northern Italian Steakhouse. Situated on the fringe of Boston's Theater District, Davio's evokes a certain nostalgia with its impressive pedigree and certainly garners many comparisons to an Italian grandmother's cooking. Service at Davio's is exceptional, with each server seemingly out on a mission to make sure that visitors have more than just the best meal of their life. From within the sprawling 9,000-square-meter dining area, guests are encouraged to tuck in to delightful appetizers like the focaccia bread served with eggplant tomato relish, hot pepper goat cheese, and Kalamata olives or the buffalo mozzarella, tomatoes, basil, and olive oil. For mains, the grilled Niman Ranch pork chop is particularly well loved, as is the fresh rigatoni. Don't forget dessert, because Davio's makes a mean cubed banana croissant with banana ice cream and a warm chocolate cake with a molten chocolate center. Looking for a restaurant that specializes in Roman cooking and delivers large portions perfect for families or, in some cases, voracious eaters? If so, then it's high time to book a table at La Famiglia Giorgio's. Located in the historic North End, La Famiglia Giorgio's treats every customer that walks through their doors like family. In fact, it's this thinking that has caused the restaurant to cook their food the old-fashioned way. The extensive menu at La Famiglia Giorgio's offers a great array of appetizers, soups, salads, sauces, seafood, pizza, and more. Standouts from the menu include the Scallop Isabella, grilled scallops served in an alfredo anisette sauce with shallots over a bed of spinach, and the La Famiglia Special, which has chicken and veal sautéed with onions and mushrooms in an alfredo pesto sauce, all served atop tri-color tortellini. One thing is certain: you'll never leave this restaurant hungry. Take a culinary trip to the beautiful Sicilian countryside and stop by other regions of Italy at La Summa Cucina Italiana. La Summa was inspired by memories that owner Barbara Summa Sullivan had of sitting at her grandmother's dinner table. It was there that Barbara learned of love and friendship as well as the art of Italian cooking. From the restaurant's humble beginnings in 1983, it was the influence and guidance of Barbara's grandmother that has made La Summa what it is today. Food at La Summa starts with basic but high-quality ingredients, which bring out the simple but memorable flavors of Sicilian cuisine. Today, La Summa serves favorites like their salsiccia pasta, pollo parmigiana, and pappardelle e melanzane with pride and joy. Make sure to try the bruschetta or funghi ripieni for starters before tucking into any of their fresh-made pastas for your main. To be frank, Lucca isn't cheap. However, true gastronomes and foodies will be the first to tell you that cost should always come second to a fabulous meal, and Lucca certainly has no shortage of those. 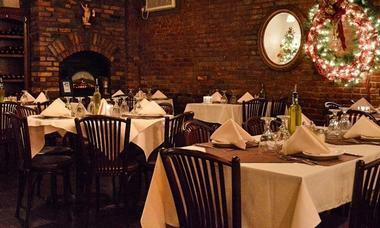 One of the most dependable restaurants in North End, Lucca consistently serves fantastic Italian dishes. They also stick to the philosophy of sourcing quality ingredients from local farms and have even cultivated strong relationships with local fishermen to make sure they get the best seafood the East Coast has to offer. Simply put, food at Lucca is beyond mouthwatering. Show-stopping entrees include the lobster risotto, which features freshly shucked Maine lobster and smoked bacon that is served over a saffron risotto, sautéed haricot vert, and chives. Pasta lovers are also bound to love Lucca's home-made rigatoni, which is tossed with the restaurant's famous agrodolce wild boar and roasted red and yellow pepper ragout, then finished with pecorino Toscano. There is something almost theatrical about Nico. Run by famed chef Salvatore Firicano, some might go as far as saying that Nico is the North End; the restaurant to end all restaurants in Boston's historic and famed "Italian Restaurant Row." Inside the aromatic enclave of Nico, Chef Salvatore sets about performing painstaking work on a daily basis, with something constantly simmering and spices smashed fresh for each preparation. Local produce takes center stage at this legendary restaurant, and each diner's table becomes a canvas of remarkable flavor. Amongst their offerings of uncompromising Italian cuisine, some must-tries include the crespelle all'aragosta, homemade Italian crepes that are stuffed generously with lobster meat and topped with onions in a lobster pink sauce, and the costata di vitello, a perfectly grilled 20-ounce veal chop that is topped with incredible wild mushrooms in a truffle sauce. 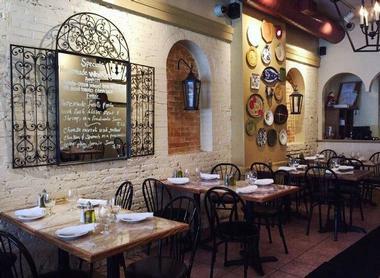 Many frequent patrons of Ristorante Limoncello will be quick to tell you that this authentic Italian eatery in the center of Boston's North End is practically their home away from home. Why? Simple. The delicious and unforgettable cuisine evokes memories of home-cooked meals in real Italian kitchens. This, of course, makes absolute sense as Ristorante Limoncello is one of the few remaining family-run restaurants in Little Italy. The go-to dish for many at Ristorante Limoncello is the Pasta Rosette. Although it is a simple combination of freshly house-made pasta, prosciutto, and truffle oil, the flavor notes are powerful and truly memorable. Other dishes certainly worth a taste include the veal marsala, chicken saltimbocca and Salmon Ala Maurizio. Located on the ground floor of Boston's Liberty Hotel, Scampo is a stunning culinary destination conceptualized and brought to life by The Lyons Group and legendary chef Lydia Shire. With a long history and reputation for defying traditional cooking, Chef Lydia Shire uses Italian cuisine as the inspiration for her incredible, unrestrained creations in Scampo. Dive into impeccable feasts at brunch, lunch, or dinner at Scampo or end your night on a sweet note with one of their beautiful desserts. Back after a night out about town? Satisfy your late-night cravings with a pizza. Whatever you decide to tuck into at Scampo, there's no doubt that the food at this restaurant, which also draws on flavors of the Mediterranean and the Middle East, will completely satisfy. A Venetian-style bacaro run by the brilliant minds of Chefs Kevin O'Donnel and Michael Lombardi, SRV stands for Serene Republic of Venice and is the first restaurant of its kind in Boston. SRV specializes in "cicchetti," or small bites, and features a stylish marble-topped bar and a stellar wine list. As such, SRV is the place to be when it comes to kicking back with a glass of your favorite drink and fantastic food. Be sure to try the pasta, which is made in-house with house-milled flour, as well as the made-to-order risotto that is practically perfection on a plate. SRV's modern interpretation of Venetian food is also beautifully showcased in their alluring garganelli, a fresh pasta made with Four Star Farms grains and served with foraged mushrooms and shaved egg yolk. At Pastoral, food is all about direct connections to culture, celebration, and community. The minds behind the restaurant, Todd Winer and George Lewis Jr., bring it all together by providing their guests with one of the few human experiences that all people around the globe have in common: eating. 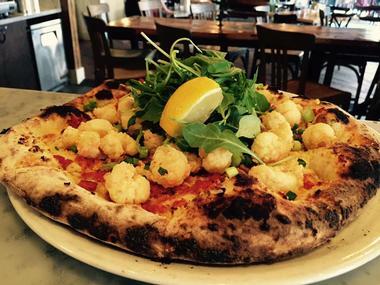 Celebrating food on a daily basis, Pastoral is legendary in Boston for their exceptional wood-fired pizzas. In fact, many will tell you to come for the pizzas and then advise you to stay for everything else. For example, while their veal meatball pizza is absolutely divine, Pastoral's creamy pumpkin risotto serves as the delectable contrast to the braised flat iron crackling and chicory. Truly, there's something for everybody at this exceptional Italian restaurant. 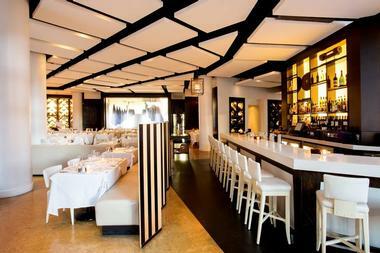 Tucked away on one of South End's quiet side streets, Coppa is best described as an intimate neighborhood enoteca. Unassuming and far for flashy, Coppa's menu features superb Italian small plates by the brains behind the operations: Culinary dynamic duo and award-winning Chefs Ken Oringer and Jamie Bissonnette. Additionally, Coppa offers fresh house-made pastas, mouthwatering pizzas, and a charcuterie program unique to their establishment. Among the refined rustic Italian offerings to choose from, guests must absolutely try the salumi and formaggi platters and the spaghetti alla carbonara, which is served with some gorgeous smoked pancetta and divine sea urchin. When it comes to Coppa's wood-fired oven pizza, the Bone Marrow is not to be missed while roasted entrees like the branzino arrosto are bound to satisfy.